The celebration of Midsummer is especially popular throughout Europe, with festivities beginning on Midsummer Eve which include lighting bonfires, especially on mountaintops, dancing around and leaping over fires, and other ancient customs. It probably originated in ancient times as sun worship, with the fires representing the power of the sun. These bonfires have been thought to have all sorts of magical properties, from driving away of evil, to ensuring health and affecting the weather. Frazer cites substantial evidence that the fires are actually sun charms. 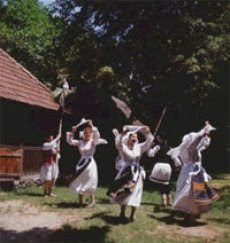 As the sun worship was forgotten, the customs remained and the theme of Midsummer became very romantic. There are a number of customs for predicting one's future spouse. A girl who sees nine Midsummer fires will marry before the end of the year, and placing certain flowers under the pillow will give you dreams of your future mate. This is also the feast day of Saint John the Baptist. On Sânziene's night the people pick healing plants and light huge purifying fires.Midsummer Day has a twofold meaning in Romania. One stands for the traditional Midsummer fairies that do a lot of mischief. The other is a reminder of the nice smelling flowers of Lady's Bedstraw. Young girls make wreathes out of them and the boys cross-shaped braids. The flowers are then thrown into the cattle pen. If the wreath gets stuck on an old beast, the future spouse will be elderly. If the animal is young, so will the spouse be. On Midsummer Eve, the lads of Maramures (north-west Romania) go out in the evening holding fire torches which they move around in the sense of the sun in the sky. When the torches are about to go out the young men descend the hills, surround the plots, enter into people's yards and give the torches to their parents to thrust them into the soil of their gardens.On the same day, in Moldavia, Wallachia and Dobruja, two or four maidens, two of them dressed as lads, perform the Wicked Fairy's dance. The girls may be accompanied by a boy who plays the flute or the bagpipe and carries a banner on which colored handkerchiefs, bedstraw flowers, garlic and wheat ears are attached. in some villages, the Wicked Fairies wield scythes and fight among themselves.The initial significance of the custom compares the maidens to ripening wheat. Thus, a transfer of fertility between the two kingdoms, animal and vegetal, is achieved. Sickles that will pull down the plants symbolize the mowing of human lives, as well as the eternal duel between winter and summer, between the good and the evil forces.Sinzienele are bad pixies of the night in Romanian folk tradition. People think these pixies could influence future marriages. Every 24 June, in the Sinziene's night, unmarried girls cut petals of a thistle flower. Then they keep that flower in a glass of water. They say that the faster petals grow back at the thistle she looks after, the bigger her chances are to marry the man she loves.